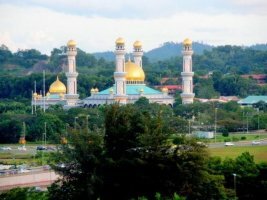 Brunei has a wealthy economy, despite its small size. It is mixed by foreign and domestic entrepreneurship, by government regulation, by welfare measures and the village tradition. Crude oil and natural gas production account for 70% of GDP. Next to crude oil and natural gas, Brunei manifests in different other types of productions. The main industries are cement production, garment making, production of pre-cast concrete structures, mineral water, canned food, dairy products and publishing and printing. 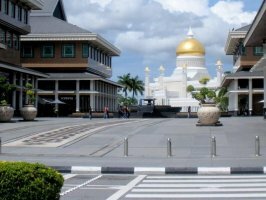 Brunei is rated 59 out of 185 countries by the World Bank for ease of doing business, a ranking based on how conducive the regulatory environment is to the opening and operation of a local firm. About 167,000 barrels (26,600 m3) of oil are produced every day, making Brunei the fourth-largest producer of oil in Southeast Asia. Producing approximately 25.3 million cubic metres of liquified natural gas per day, makes Brunei the ninth-largest exporter of the substance in the world. Brunei borders with Malaysia. The top export partners of Brunei are Japan, South Korea, Australia, India and Vietnam. The top exports of Brunei are petroleum gas, crude petroleum, acyclic alcohols, jewellery and diamonds. The minor fields consist of machinery, metals, instruments, textiles, foodstuffs and chemical products. Brunei import is a very important part of the country's economy, due to lack of many other natural sources. Products processed from imported units either remain inside the country or are exported, but still petroleum gas and crude petroleum are the main export products that give substancial income. The economy and social infrastructure have been developed through a series of national development programmes. During the 1990s, the emphasis was on social services and public utilities. This continued into the 2000s, together with diversification of manufacturing and encouragement of private investment, including foreign investment. Major projects like a gas pipeline, a power plant, upgrade of the international airport, development at the port of Muara, and an industrial park with a methanol plant that began production and exports in mid-2010, required import of many products. The top import origins are the United Kingdom, Malaysia, Singapore, China and the United States. Its top imports are gold, cars, refined petroleum, iron pipes and planes, helicopters and spacecraft. Brunei imports 60% of its food requirements. Others are manufactured goods and chemicals. Brunei is a country located in the southeastern Asia close to the Australian continent. The country shares borders with Malaysia and has an opening to the South China Sea. It consists of two territories apart, but very close to each other. Brunei has recently announced that all tariff barriers with the ASEAN (Association of Southeast Asian Nations) will be removed by 2015. The country is a member of the World Trade Organization (WTO) and of the Association of Southeast Asian Nations (ASEAN). Brunei has a very low ad valorem tariff for imported rates of 2.5%. The country has a low tariff regime and no personal income tax. Company tax is 55 per cent for the two oil and gas companies (Brunei Shell and Jasra Elf) and 30 per cent for other companies. Brunei is a member of the Association of South East Asian Nations (ASEAN). Preferential rates are applied to imports from other ASEAN members. Brunei Food traders and importers are required to comply with the Brunei Public Health (Food) Act, besides meeting the food import requirement whenever importing consumable items. The value for assessment of import duties is based on the national concept of value. Valuation is based on the Brussels Definition of Value, i.e. based on price which an importer would give for the goods on a purchase in the open market inclusive of freight, Insurance, commission and all other costs, charges and expenses incidental to the purchase. Assessed value is therefore based on Carriage, Insurance and Freight (C.I.F) declared in invoice and are checked against value dockets, price lists and /or expert opinion. Within 24 hours after the arrival of a vessel, the master or agent of the vessel is required to present the following documents to the proper Customs Officer: Port Clearance, Inward Manifest, Crew List, Ship Stores List and all other necessary documents pertaining to the voyage. - For goods by air, a certified inward manifest of an arriving is also required by Customs. Before any cargo can be unloaded, transshipped, or removed onto another vessel, permission must be obtained from a proper Customs Officer. Goods may be declared by the owner or importer or an agent appointed by the owner or imported an approved by Customs. The declarant is responsible for the accuracy of the particulars of the declarations and for the payment of Import Duties. Prior to importing of any restricted goods, a permit (A.P) must be obtained from Customs. An applicant for such permit must fill in the prescribed form in quadruplicate and submit it to the Controller of Customs. All goods, whether they are dutiable or not, must be declared in the prescribed from and submitted to the Customs where the goods are to be imported. Declaration should give full and true account of the number of packages, cases description of goods, value, weight, measure or quantity and country of origin of the goods. Four copies of the declaration should be made. - all other documents such as certificate of origin, Import licences, and insurance papers which may be required by a proper Customs Officer. Dutiable goods may be move from one place to another within the State with the permission of the Controller of Customs and such movement, when granted, must be accompanied or covered by a Local Permit issued by a proper Customs Officer. Amendments and withdrawals of declaration will be allowed. These should be made in writing stating legitimate reasons. Before goods can be cleared from Customs control, the owner or importer of the goods must submit a declaration to Customs on prescribed forms. Goods deposited in a Customs control, the owner or importer of the goods must submit a declaration to Customs on prescribed forms. If goods are not cleared within the specified time and the warehouse rent in respect of the goods has not been paid, a Senior Customs Officer may arrange to sell such goods by auction. The proceeds of the sale of any such goods shall be applied to the payment of any Customs duties, warehouse rent, port dues and rates and other charges which may be due in respect of such goods, and the surplus, if any, shall be paid to the owner of such goods. Examination is carried out after the declaration of goods has been accepted and duties have been collected. Goods for examination must be produced by the importer or the importer’s agent at prescribed places during the normal working hours. If an importer or the importer’s agent requests his goods to be examined outside the normal working hours, he has to pay overtime fees to Customs. Examination is carried out in the presence of the importer or the importer’s agent. He will be responsible for opening, weighting, sorting an marking of goods and all other necessary operations as directed by a proper Customs Officer. Examination is carried out to the satisfaction of a proper Customs Officer. He may, as his duty requires, take samples of any goods or cause such goods to be detained for the purpose of ascertaining whether or not they are dutiable. The owner of the goods or the agent who has been approved by Customs may declare the goods and must be responsible for the accuracy of the export declaration. The export declaration must be made in quadruplicate and must be accompanied by related documents (i.e. export licenses and invoices). Importation and exportation of dangerous drugs such as opium, heroin, morphine, and psychotropic substances such as LSD, DET, DMT, DOM, mescaline, barbiturates and amobarbital are strictly prohibited. The Misuse of Drugs Act 1978 imposes severe penalties, including the death sentence for possession, consumption, manufacturing and trafficking of drugs. Genuine import of legitimate drugs or medicines including poisons should be covered by a license and permit issued by the Ministry of Health. Information and exportation of certain goods requires a license or permit from the appropriate authorities in the State. Every company or agents/ forwarders must be registered with the RCED for them to be easy dealing with the RCED. *Individual registration is not compulsory however customers (traders) are advised to make use of the services of Customs agents (forwarders). - License or Permit is a verification or approval given/ issued by the relevant Government Department/ Agency responsible for the commodities before importation. - Written application or completed form (subject to the requirement of the Department/ Agency) must be submitted to the Department/ Agency responsible for such prohibited and controlled commodities. - There are some prohibited or controlled commodities that require A.P (Approval permit) issued by the RCED other than license/ permit issued by the relevant Government Agency before imported or exported. Every person arriving Negara Brunei Darussalam shall declare all goods in his possession, either on his person OR in any baggages OR in any vehicles to proper officer of Customs for inspection and clearance. If failed to do so, such goods shall be deemed to be uncustomed goods and it is an offence under Customs Order 2006, if convicted, imprisonment OR fines can be imposed. Passenger hand baggages or personal effect on arrival. Customs Declaration should give full and true account of the number of packages, case description of goods, value, weight, measure or quantity, and country of origin of the goods. Once the customs declaration had been approved, duties and other charges can be paid at Customs Counter or via an online payment. The approved Customs Declaration may be presented to Customs Officers on duty at relevant Customs Branches (entry point), together with any other supported documents for examination/ inspection and release of goods.